Whether it's the ocean of St. Maarten, where I'm posting from today, the Doctor's TARDIS, or my favorite color M&M, I'm always on board with blue. And to be clear, I'm not posting while IN the ocean. That'd be a sad way for my Macbook to meet its demise. Rather, I'm posting from above the ocean on a cruise ship. Just in case you thought I was inhaling too many polish fumes. So here are my top FOUR blues for 2012! Essie Where's My Chauffeur was the biggest surprise for ME of the year, mainly because I never go for pastel cremes. But once this was actually in my hands and on my nails, I was a goner! It's a bit streaky with two coats, but evens out at three. When it comes to blues, I always have faith in Zoya. In fact, I own more blues (13 in all) than any other color from the company. Nothing else is even close. Zoya Song is a true royal blue glass fleck shimmer that didn't even come close to staining. I. Love. It. So. Much. I. Can't. Take. It. 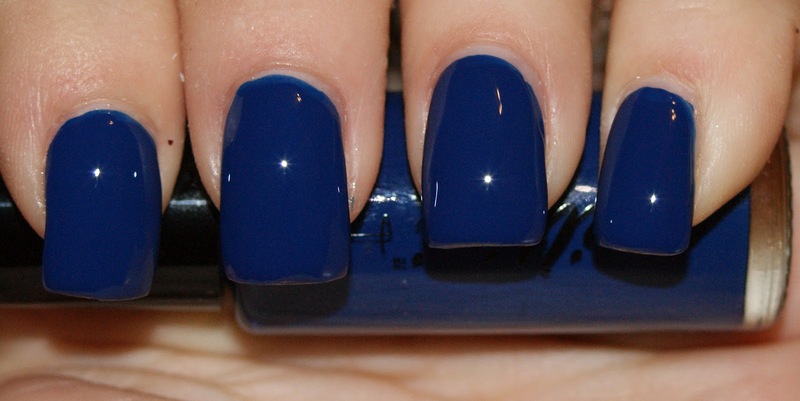 Nailtini Admiral Perry is the PERFECT navy creme. It's got such a brightness to it, though it is rather vampy, and I'm just obsessed. The coolest blue has got to be Seuss from Whimsical by Pam. It's a milky turquoise blue base with small red hex glitter and larger silver hex glitter. Am I slightly biased because I call my dogs Thing 1 and Thing 2? Uh, probably. But it doesn't make this any less awesome! What's the blue YOU can't live without? Priti NYC Canterbury Bells is my go-to blue....or butter LONDON Blagger! But I agree that Where's My Chauffeur? and Song are PHENOMENAL!! =) Enjoy that cruise girl!